FBX® data exchange technology is a 3D asset exchange format compatible with many 3D tools. FBX facilitates higher-fidelity data exchange between several Autodesk content creation packages and supports certain third-party and propriety applications. Using FBX files in the work flow can make it easier to transfer and retain data, in other words it’s just a quicker way to copy 3D information from one product to another. This example shows 3D data taken out of Revit and adding to a 3D Studio Max scene. Below is content loaded in to a Revit file. This content can now be saved as a FBX file. This could also be saved as a project file in a suitable folder for future access, or as an alternative suggestion a number of like components let’s say tables could be imported in to a file, saved as both project and FBX files. 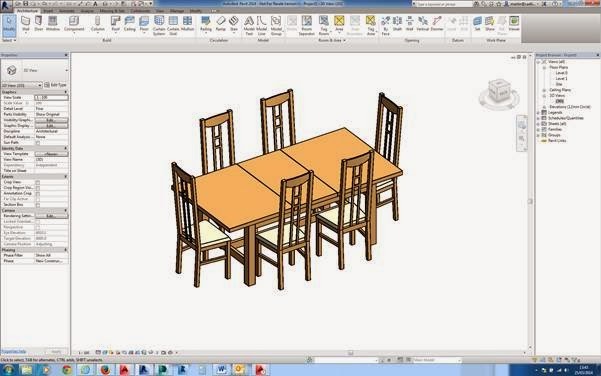 The contents in the project file may be accessed just like the “SYSTEM FAMILY” files in Revit. Components once selected may then be copied from the project file to the clip board, and then pasted from the clipboard into the new project file. The contents of the FBX file can be imported straight in to 3DS Max, deleting the unrequired components. 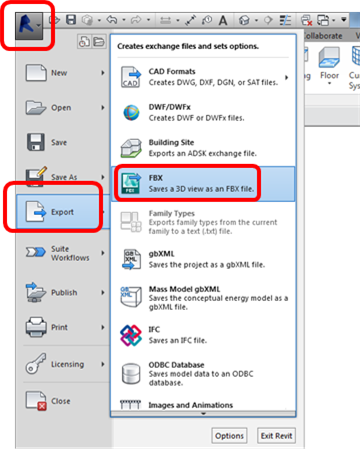 Select the stylised “R” icon (APPLICATION BUTTON) at the top left of the Revit application, the application tools are now displayed, from these select “EXPORT” now select “FBX”. 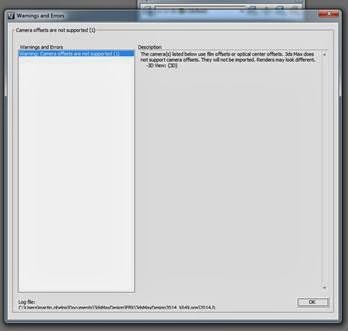 The “EXPORT” dialogue box is displayed allowing the saved location of exported file to be selected and file name to be specified, and the file “SAVED”. To import the FBX data into 3D Studio Max. Start a new 3DS Max scene. 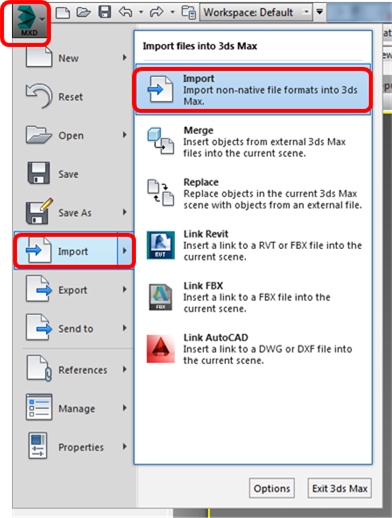 Select the stylised “3” (APPLICATION BUTTON) in the top left of the 3D Studio Max application, from the displayed list of commands select “IMPORT” the “IMPORT” options are now displayed. Select “IMPORT” at the top of the list. The “IMPORT” dialogue is now displayed. 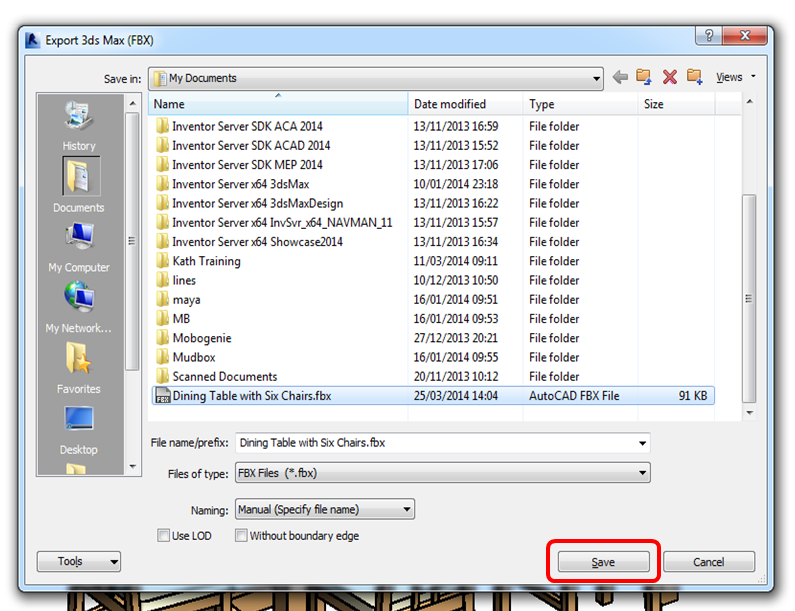 Change the “FILES OF TYPE” to “Autodesk (*.FBX)” and locate the relevant file, using the “LOOK IN” drop down. Select “OPEN”. The “IMPORT” FBX dialogue is now displayed through which the “IMPORT” presets may be changed and saved. After the “OK” button has been selected any errors will be displayed in the following dialogue box, this acts as a visual warning but a log file is also generated which can be viewed later. The 3D data is now imported in to the 3D Max scene. 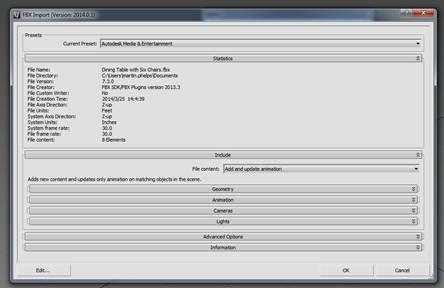 As well as the 3D geometry a camera is also added, which I would simply delete and use a “3D Studio Max” camera instead. 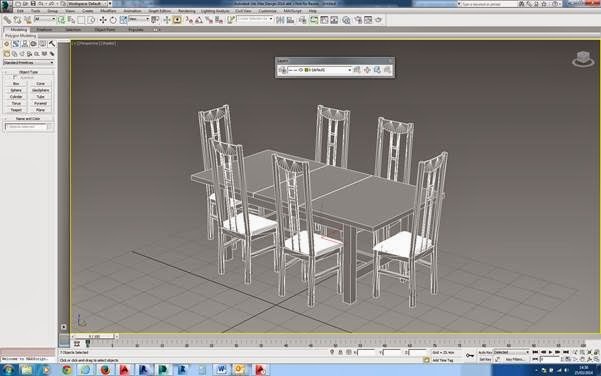 Dining table and chairs “IMPORTED” in to a “3D Studio Max” Scene. More 3DS Max tips to follow in later Blogs.